This month is a great time to celebrate children’s television programming in the State of Iowa. After all, Iowa Public Television is debuting their new IPTV Kids Clubhouse with host, and personal friend of yours truly, Dan Wardell. If you have kids (or you are a kid at heart) I would recommend checking it out. This undated image shows longtime host of The Magic Window, Betty Lou Varnum, on the set of the show. Photograph from box 4, folder 6 of the Betty Lou Varnum Papers, RS 5/6/53. Of course, any discussion of children’s programming in Iowa eventually leads to talk of WOI-TV and America’s longest-running children’s program (who am I to argue with Wikipedia? )–The House with the Magic Window. Originally called The Magic Window, this program aired in central Iowa on WOI-TV from 1951 until 1994 and for nearly 40 years was hosted by Betty Lou (McVay) Varnum. Betty Lou became a fixture in most central Iowa households and almost anyone growing up here during this time could tell you who Betty Lou was and name each of her puppet friends that regularly appeared on the show. However, Betty Lou was not the first host of The Magic Window. Other hosts included Virginia “Ginny” Adams, Joy (Ringham) Munn, and Arjes “Sunny” Sundquist. Each of these women hosted the show for a year or so until Betty Lou took over permanently. Special Collections and University Archives has kinescope (16mm film) recordings of some of the earliest episodes of The Magic Window in our collections, but sadly we only have one recording, dating from 1955, of Betty Lou as host of The Magic Window! Something most people may not be aware of is that WOI-TV produced a second children’s program in 1954 called Window Watchers (I see a theme here). 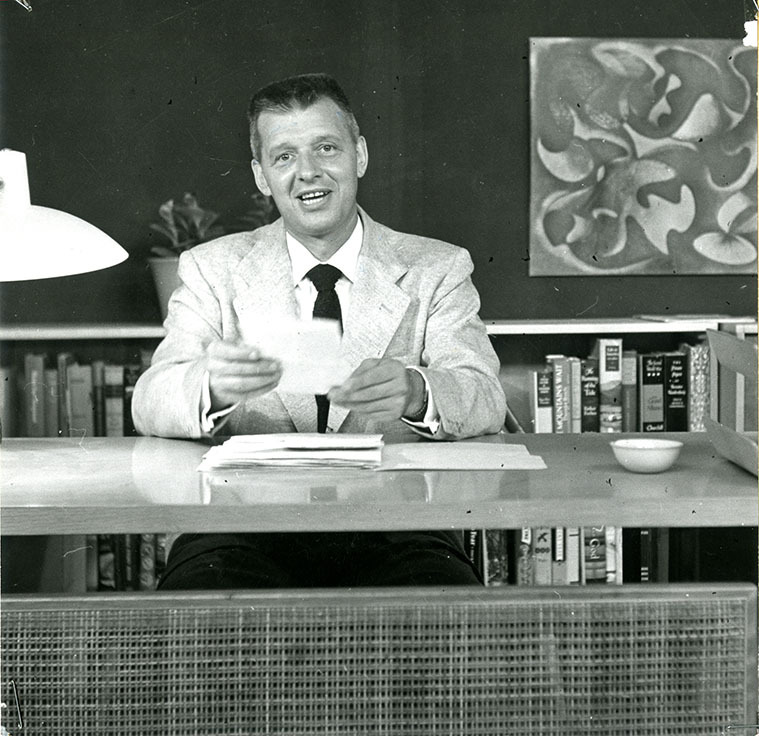 This program was sponsored by the National Educational Television and Radio Center, later known as the Public Broadcasting Service. Window Watchers was hosted by Arjes Sundquist and featured a format very similar to that of The Magic Window. To view some of these early children’s programs, visit our YouTube Channel! 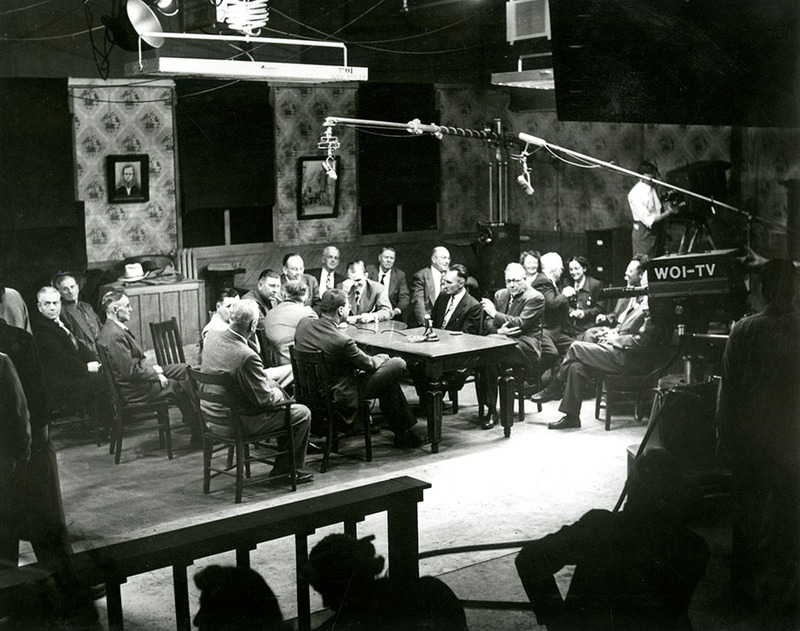 For more information on WOI-TV during the time it was owned and operated by Iowa State University, read through some of the finding aids listed on the Special Collections and University Archives website on this page. It’s that time again! Time to get together with family and friends and celebrate the holiday season. For many, that season means Christmas, and with Christmas comes lots and lots of food. In case any of you are still trying to figure out your menus, here are some ideas courtesy of WOI-TV’s Homemaker’s Half-Hour. While these menus were originally created for Christmas, I see no reason why they couldn’t be used or adapted for Hanukkah or Kwanzaa, or anything else anybody might celebrate. Festive Relish Tray: celery, pickles, carrot sticks, etc. Below are a couple of recipes featured in the notes for this menu’s episodes. Unfortunately we don’t have recipes for all of these items, but I’m sure similar recipes can be found online. Well, maybe not for everything, but then again the internet is full of surprises! Many more menus – holiday or not – are available in the WOI Radio and Television Records, as well as scripts of Homemaker’s Half-Hour and other productions. 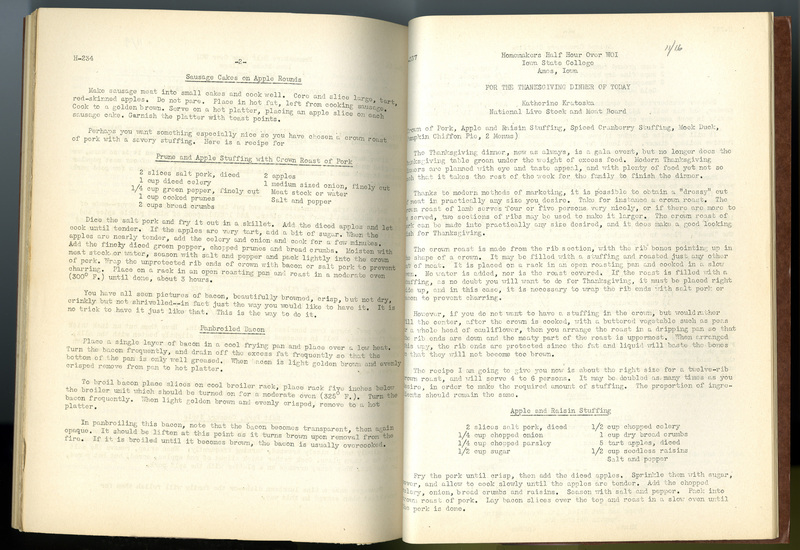 Our cookbook collection is also full of some great and interesting recipes, some of which you can view online. Whatever you celebrate, however you celebrate, we wish you a very happy holiday! Here’s a Halloween treat for those of you who stayed up late watching TV in the 1960s: a photo of the cast of WOI’s Saturday night horror movie show Gravesend Manor. Gravesend Manor, or Grave’s End Manor as it was sometimes printed in programming schedules and notes, aired on Saturday nights at 11:00 in the 1960s and possibly the late 1950s. Our information on the program is limited, but programming notes and programming schedules indicate the show ran for certain in 1960, and then from 1964 through 1968. The program was one of those classic horror movie showcase shows in which a spooky host – such as Malcom the Butler, above – presented old, often B-movie quality, horror movies and would add in their own bit of humor. A current example is Svengoolie, whose show is broadcast on MeTV (channel 8.2 in the Des Moines broadcasting area) on Saturday nights. A couple of older examples include Vampira in the 1950s and Elvira in the 1980s. Some information on Gravesend Manor can be found online at DesMoinesBroadcasting.com and on a few websites dedicated to these types of shows, which can be found by conducting a Google search of Gravesend Manor. The only known remaining footage of the show consists of outtakes, which is featured on this YouTube video. Curious researchers are more than welcome to stop in and research the WOI Radio and Television Records, RS 5/6/3, to see what else we might have on this program! Additional photos can be found in WOI Radio and Television Photographs, RS 5/6/6 in Box 1. The 1920s: age of jazz, flappers and sheiks, the Charleston, and Prohibition. It was also arguably the decade in which the Golden Age of Radio began. At the very least, radio started to become quite popular during this time. The dapper gentlemen in the photo look as though they’re getting ready to go on the air in the WOI recording studio. WOI first went on the air on April 28, 1922, with market news as its first regular feature. The station began broadcasting Cyclones football games in fall of 1922. Two long-running radio programs began in this era, Music Shop (originally introduced by Andy Woolfries) and The Book Club. The former began in 1925 and ended in 2009, while the latter began in 1927 and ended in 2006. More information on WOI radio can be found in the WOI Radio and Television Records, the WOI Radio and Television Biographical Files, these other related collections, and more photos can be found on our Flickr site. Thanksgiving is rapidly approaching – the holiday season is here! 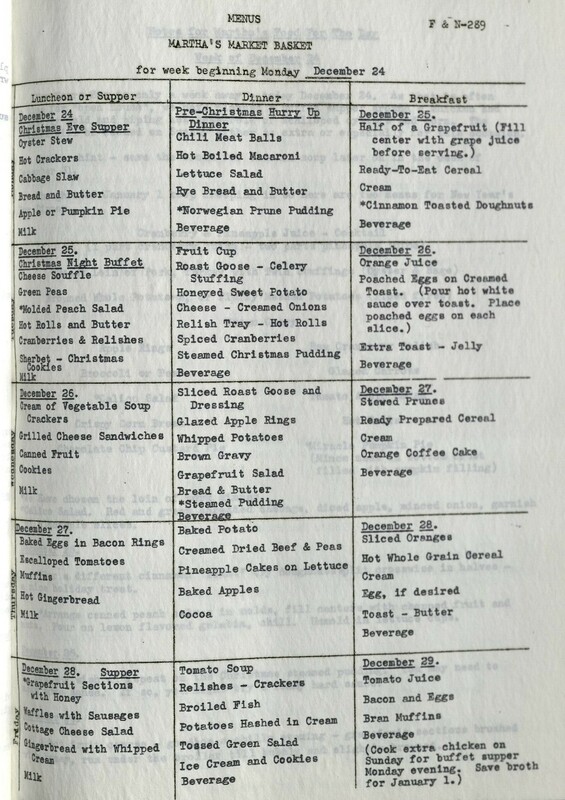 Holiday recipes can be found in a variety of places in Special Collections, including homemaking radio show scripts from the WOI Radio and Television Records (RS 5/6/3). Homemaking radio shows were popular during the early to middle part of the 20th century, and Iowa State’s own WOI hosted programs for homemakers, including Homemaker’s Half Hour. Homemaker’s Half Hour aired over WOI radio from the late 1920s through the early 1960s. We have script books from Homemaker’s Half Hour here in our University Archives. These scripts contain recipes which are often chosen based on upcoming holidays or time of year. 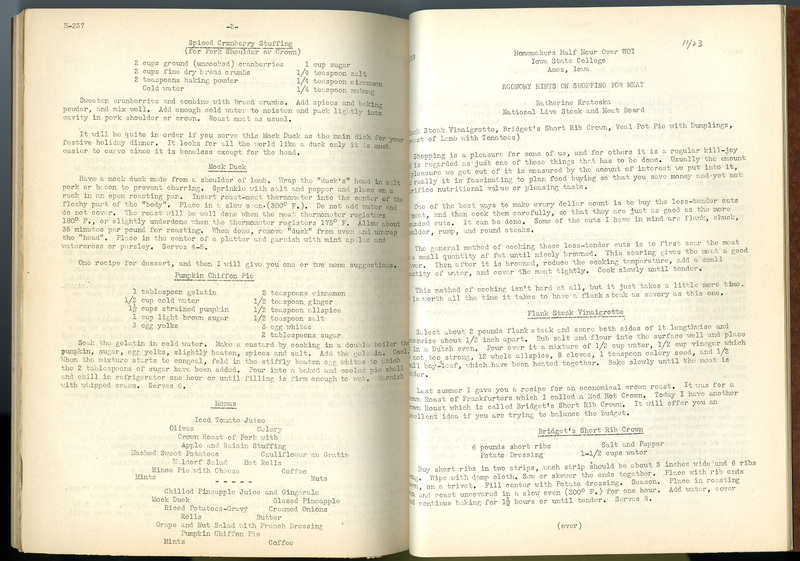 Below are Thanksgiving recipes from the first Homemaker’s Half Hour script book in the WOI records – from 1937 (earlier script books can be found in other collections – see below for a few links to these finding aids). The recipes include crown of pork, apple and raisin stuffing, spiced cranberry stuffing, mock duck, and pumpkin chiffon pie. You can click on the pages to get a larger image. Sweeten cranberries and combine with bread crumbs. Add spices and baking powder, and mix well. Add enough cold water to moisten and pack lightly into cavity in pork shoulder or crown. Roast meat as usual. You will probably notice that there is no turkey in the array of recipes. Is this a Depression or Dust Bowl era phenomenon? Was it more practical to raise pigs and sheep? Whatever the reason for the lack of turkey in the Thanksgiving script above, the recipes look delicious! The Homemaker’s Half Hour 1937 script book and more can be found in the WOI Radio and Television Records (RS 6/6/3), and the finding aid is available online. Other Homemaker’s Half Hour materials can also be found in other collections, including the Winifred R. Tilden Papers (RS 10/7/11) and the Barbara Ellen Forker Papers (RS 10/7/13). 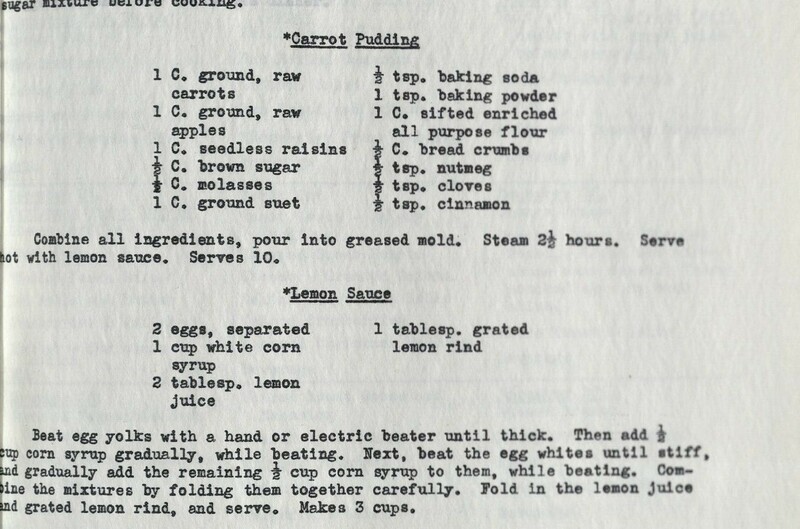 Information on the library’s Iowa Cookbook Collection can be found here. If you are interested in taking a look at some of the homemaking radio show records, please come visit us here in Special Collections. However, if you would like to make photocopies of any of the materials please ask first. The script books in the WOI records are not easy to photocopy. More on homemaking radio shows here at Iowa State and in Iowa can be found in this earlier post. Today (Thursday, March 11) and over the weekend, Iowa Public Television will be showing a program called Iowa’s Radio Homemakers. The Special Collections department contributed film footage and photographs to the show. The program focuses on how rural women in Iowa listened to the radio for news and information, in addition to entertainment, and a popular form of radio show they tuned in for were the homemaker radio shows. These programs provided information on a wide variety of topics including food, nutrition, recipes, child rearing, sewing and gardening. One of the radio homemakers featured on the show is Evelyn Birkby (to hear Evelyn Birkby describe her experiences, watch this youtube video). Our Special Collections Department has a number of her books, including Cooking with KMA : Featuring 60 years of Radio Homemakers (TX715.B49924 1985). 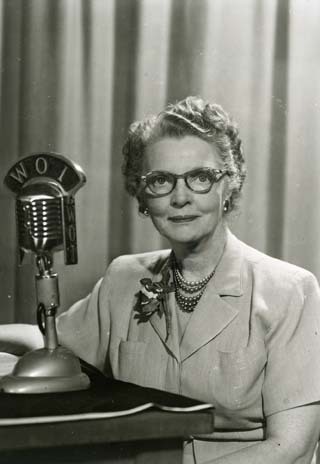 Iowa State’s own WOI had a number of radio shows for homemakers, including the popular “Homemaker’s Half Hour.” The WOI Radio and Television Administrative Records (RS 5/6/3) here at the University Archives has a variety of documents from the program, including scripts, interviews and recipes. “Homemaker’s Half Hour” programming director for many years, Eleanor Wilkins (known as Martha Duncan on radio), worked in the food and nutrition department of ISU when she started at WOI in 1938. An interesting folder in the WOI Radio and Television Administrative Records (RS 5/6/3) contains letters written to Duncan from women who had been educated in home economics. They wrote of how their education had influenced their careers and lives. These letters were for a program she was planning on careers. When Martha Duncan retired as host of the program in 1966, the “Homemakers Half Hour” also ended its continuous run since 1925. ISU home economics class from 1953. 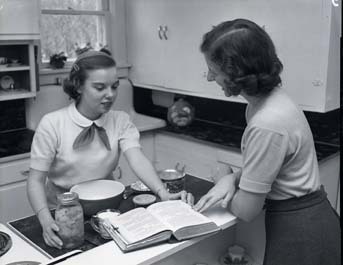 In addition to producing radio shows for homemakers through WOI, Iowa State University had another important contribution to the radio shows and homemakers through its programs of study, such as home economics (now more commonly known as Family and Consumer Science), first taught as Domestic Economy in 1872. Women graduating with a degree in home economics contributed valuable guidance to the people of Iowa and the nation in the area of home economics. In honor of Women’s History Month, or just to learn more about radio programs for homemakers in Iowa, come visit the Special Collections Department. We have some collections (RS 5/6/3 and RS 10/12/3) and and rare books related to these programs, in addition other homemaker related collections (such as MS-60).